A 21-year-old otherwise healthy male presented to the emergency department 24 h after a fall onto an outstretched hand, during the course of which he experienced hyper-extension of the right thumb and immediately noted severe pain. His range of motion had been decreased since the injury. His physical examination was notable for marked edema over the thenar eminence, along with ecchymosis and dimpling of the skin over the volar aspect of the metacarpal head. He was tender over the metacarpophalangeal (MCP) joint and had diminished range of motion. 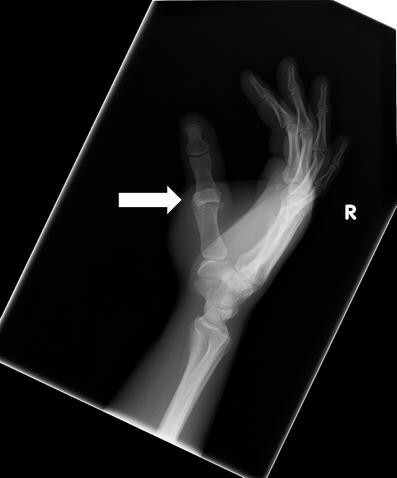 Radiographic examination of his hand revealed a dislocated MCP joint (Figs. 1 and 2). Orthopedics was consulted and took the patient to the operating room for open reduction. Complex dislocations occur when the volar plate is ruptured and the plate becomes lodged between the base of the proximal phalanx and the metacarpal head. Historically, this type of injury has been thought to be inherently irreducible by closed technique, and expeditious surgical management is advocated [1, 2]. Some recommend a gentle attempt at closed reduction be performed by an experienced surgeon prior to operative management . 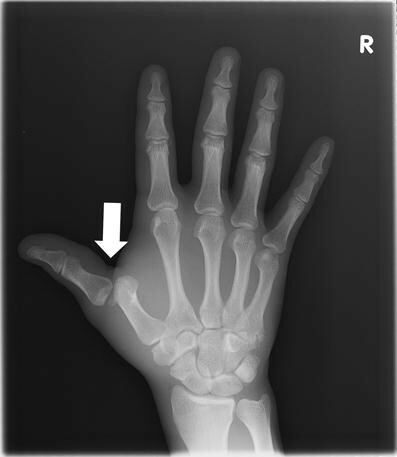 The position of the proximal phalanx parallel to the metacarpal is commonly seen on radiography. The radiographic finding of entrapment of one or both sesamoids within the joint space is rare, but classic for a complex MCP dislocation and seen in this case . In addition, the dimpling noted over the palmar aspect of the hand is pathognomonic and was first reported by Kaplan [5, 6].